WPI robotics graduate student Tess Meier (left) moderates the Clinician Panel discussion. 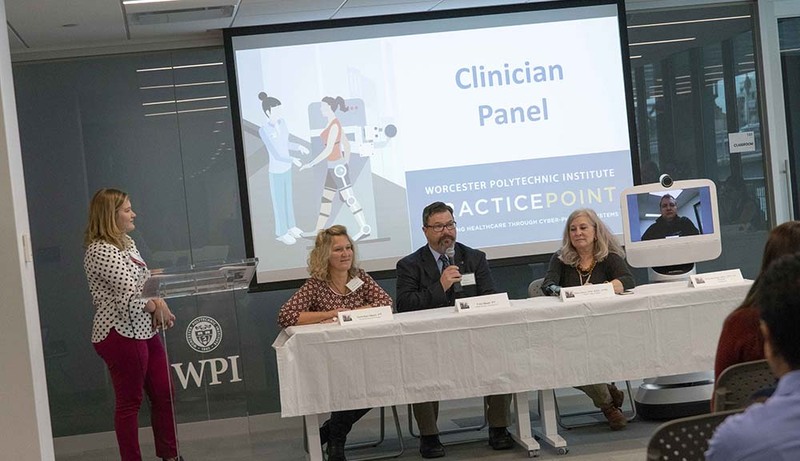 Worcester Polytechnic Institute hosted its first PracticePoint Collaborative Forum this week at WPI Seaport in Boston, bringing together stakeholders from points along the medical device spectrum to focus on robotic solutions to limb impairments. Researchers, device manufacturers, clinicians and patients who use assistive devices met to open a dialogue that is both rare and vital to the future of assistive technology. robot during a coffee break. PracticePoint Collaborative Forums are intended to bring together key stakeholders from industry, academia, healthcare, and user/patient groups to help identify, discuss, and address challenges in various healthcare technology fields. PracticePoint is a membership-based R&D and commercialization alliance, made possible by the Massachusetts Technology Collaborative, that seeks to improve healthcare technologies and develop new medical cyber-physical systems. The inaugural forum, co-sponsored by MassMEDIC, began with a panel of assistive device users, including WPI student Jared Grier '19 and alumnus Michael Conrad '06, '15 (MS MG), '16 (MS SE), '16 (MBA), '18 (MS ECE), both of whom use wheelchairs. Grier and Conrad joined one panelist who utilizes a prosthetic leg and another with traumatic brain injuries, who was accompanied by her mother, who quit her job to care for her daughter full time. The panelists shared the triumphs—and trials—of their experiences with assistive devices and fielded questions from researchers and clinicians. This direct channel of communication between patients and other stakeholders in the medical device community is a cornerstone of both the forum series and PracticePoint, as its purpose is often overlooked yet essential to developing products that improve the lives of device users and caregivers. The forum also included two keynote speakers and panels led by medical device companies, including Massachusetts companies Myomo, Delsys/Altec, and Liberating Technologies as well as ABLE Human Motion, a device company located in Spain. In addition, there was a panel of clinicians who joined from Pine Bush Physical Therapy in New York, Western New England University, and Handspring, an upper limb prosthetic care company with locations across the United States. Researchers from WPI, MIT, and the City University of New York came together in the final panel of the day to discuss opportunities and obstacles that lie ahead in medical device research. the event with her mom. Throughout the day, the theme was clear from every community: collaboration is key to the future of meaningful, patient-centered care. The collaborative focus of the series mirrors PracticePoint itself. Working together, PracticePoint members will spearhead advances in digital medical technologies, robotics, cloud computing, wireless technologies, and data science. PracticePoint researchers will leverage existing healthcare, medical device, robotics, cybersecurity, and big data ecosystems. PracticePoint unites these industries around the central purpose of positioning Massachusetts as a leader in this new wave of technological evolution and preparing its workforce to meet the challenges associated with a transformational disruption in medical technology.